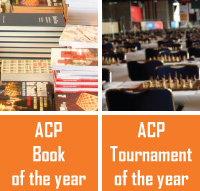 The ACP Board is concerned about the conflict between GM Alexei Shirov and the Latvian Chess Federation. As a consequence of this conflict, the top player of the country is not allowed to represent his Federation, and at the same time is not allowed to join another Federation without a very substantial transfer fee. We can not judge on the circumstances of this lasting conflict; rather we see the problem on a much bigger scale. It is completely unfair that a professional player can de-facto be enslaved by his/her National Federation. Current regulations provide that a player wishing to take part in any FIDE individual or team event obtains the approval of his/her National Federation. When this approval is denied, the player simply cannot participate in any World/Continental championship. This is unacceptable. When a National Federation declares a player persona non-grata in the local chess community, this substantially translates into a ban. Last year we had the case of GM Zhang Zhong and WGM Li Ruofan with the Singapore Chess Federation, and now we are witnessing the same story with GM Shirov. This is clearly an abuse of current FIDE regulations, and possibly one that was not foreseen by FIDE at the time of drafting the regulations. For this reason, ACP calls on FIDE to adjust its regulations in order to remedy this unwanted and very detrimental situation. When these conflictual situations arise, we strongly suggest that FIDE allow players to play under the FIDE flag. In this particular instance, therefore, we call on FIDE to approve the request of GM Shirov to play under its flag, as chess professionals should never be banned from any official competition in such an unfair way.